(no event on: 31 Dec). Our Czech Beer Tasting session covers the seven main types of beer brewed in the Czech Republic, ranging from light pilsners to dark porter ales. The Czechs are the largest consumers of beer per capita on the planet. The world's first golden lager, Pilsner Urquell, was created here. So you could say we know a thing or two about beer here in Prague! The tasting session is held at a historic bar in the Old Town. It is led by our resident Beer Master, who explains the brewing processes and ingredients employed in the making of each of the beers you sample. Participants gain an appreciation of the varying complexities of taste and finish in the different beers. Plus you learn about the history of beer brewing in the Czech Republic, and of the brewing traditions adopted by the master brewers. Many pubs in Prague are tied to the beers of a single brewery. The Czech Beer Tasting offers you the opportunity to try a full range of beers in one sitting, right where they can be best appreciated: in the heart of Prague. This activity will appeal to adults of all ages and nationalities, because it is simply fun, relaxed and informative. Fundamentally, the Beer Master loves Czech beer and enjoys transmitting his passion and enthusiasm for it to others. Prague Experience activities are in English. -Evening pub/brewery tour: Prague Pub & Beer Tasting Tour. -Daytime pub/brewery tour: Prague Brewery Tour. 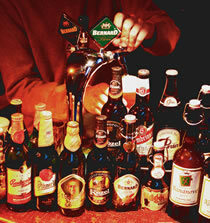 -Calm pub tour: Prague Pub Tour. -Wild pub tour: Prague Pub Crawl. -Trip outside Prague: Kozel Brewery Tour. Beer tasting of 7 varieties of Czech beer + Traditional beer snacks.